Many schools require or even distribute a homework diary to each student, but if your child has never used a homework diary then a gentle introduction to this tool should be in order. 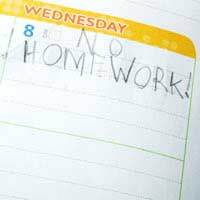 Homework diaries help to both remind students of their study responsibilities for that evening as well as notify parents of what is required of their children. A homework diary may be a store-bought item, but even just a simple notebook will do if children fill out certain basic details. The subject that requires homework, when the homework is due, details of the homework and a place for a parent or teacher signature are all important parts of keeping a homework diary. It’s very easy for children to vaguely remember that they have homework for the evening, but it’s much harder for them to remember the exact details of what they have been asked to read, do or study. The first step to helping them jog their memory is to have them write down which subject has assigned homework. Using the exact name for the class or subject is important. For example, children can write down “reading” or “writing” instead of just “English,” or they can write down “band” or “choir” instead of just “music.” It may well be that the more specific the child’s notation the more likely they will be to remember more about the assignment. Once children have noted that they do have homework, recording when it is due is important as well. Most homework will be due the next day, but occasionally there are bigger projects or teachers give hints about things that will be due in the near future. If homework is not due the next day, parents can help children set mini-deadlines for themselves to help with their time management. For example, if a teacher assigns homework of “read 30 pages of leisure reading by next Friday,” parents can help children select a book by Monday, read 10 pages on Tuesday, read another 10 on Wednesday and the final 10 on Thursday. Children who practice setting their own deadlines like this will become better with their own time management in the future. As children get older, homework often becomes more detailed with specific questions or problems to answer. Children must note down the details of such assignments. For example, children who write down that they have maths homework must then write down that they are required to complete all problems on page 50 of their textbook and every odd numbered problem on page 51. If a child comes home with vague details, such as “reading handout” then parents can encourage them to write in more details. Which handout? What is it about? Are there any questions with it? Are they meant to discuss or write about what they have read? By questioning children parents can teach them about the kind of details of which they should become conscious. If a homework diary has come about because a teacher suggests it then parents are well within their rights to ask that teacher if they would be willing to sign the diary every day for a set amount of time. By such a signature parents can feel more confident that what their children have entered is the full and complete homework load for that day. However, parents may also want to sign the homework diary themselves to reflect that they have indeed seen it or they are certain that their children have completed the noted assignments. Keeping a homework diary is a routine that parents and children should embrace. The most basic information needed for a good homework diary includes the subject that has assigned homework, the date the homework is due, details of the homework assignment and the signature of a parent, teacher or both. I love school I have been told I could go on this app to do homework ??! !